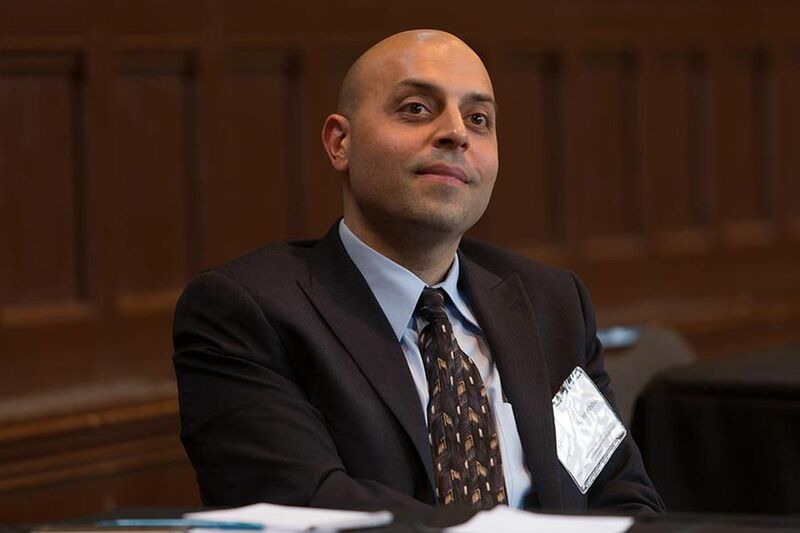 Sa'ed Atshan, Swarthmore College Peace & Conflict Studies Assistant Professor. The two Friends' Central School teachers fired last year after a flap over inviting a Palestinian professor and peace activist to speak to students have sued the Main Line Quaker school and its top officials, claiming they were wrongfully terminated. In a lawsuit filed this week in federal court in Philadelphia, Ariel Eure and Layla Helwa claim that the Wynnewood school not only violated their civil rights by firing them after the slated talk by Swarthmore College professor Sa'ed Atshan was canceled in February 2017 but that school officials made a series of defamatory statements against them. The suit also targets the head of school, Craig Sellers; chief trustee Phillip Scott; and unnamed board members for the alleged defamation campaign that, according to the suit, cast the teachers in a "false light." It seeks back pay and other compensation as well as punitive damages. Filed by attorney Mark Schwartz, the suit states that "the absolute tragedy is that a school which professes to operate according to the fundamental Quaker principles of tolerance has proven to [be] intolerant where the administration and board maintain an illegal atmosphere depriving two teachers of their civil rights." Friends' Central attorney David Fryman said in a statement that the lawsuit "lacks merit" and that the school has attempted to mediate a resolution, but he did not provide details. The school, Fryman said, "engaged in a thorough and thoughtful Quaker process before deciding not to renew [the teachers'] contracts. We expect the court will agree." Officials at Friends' Central previously said the teachers were fired because they were present at student protests against the cancellation of Atshan's lecture, which came after some Jewish parents and others complained about the proposed speaker's past statements on the Israel-Palestinian conflict. The civil rights lawsuit replaces an earlier federal Equal Employment Opportunity Commission (EEOC) complaint filed against Friends' Central when the school initially placed the pair on administrative leave. The teachers had said the school offered them $5,500 each in severance pay if they would drop the EEOC case when they were notified of their firing in May 2017. The EEOC terminated its investigation once the federal lawsuit was filed. "I am disappointed that Quaker organizations have been silent on the outrage that occurred at a purportedly Quaker school," Schwartz said Tuesday, adding: "I am gratified that there is a forum which Mr. Sellers can't control, namely the federal courts." The lawsuit is the latest turn in the ongoing controversy over free speech and the fiery cauldron of Middle East politics at one of the region's more prestigious private schools. It began when the teachers invited Atshan — who'd been raised as a Quaker on the disputed West Bank and is now as assistant professor of peace and conflict studies at Swarthmore — to speak in February 2017 to a student Palestinian peace club that they served as advisers. But the talk was canceled when some parents complained about Atshan's support for the Boycott, Divestment, Sanctions movement, or BDS, which aims to pressure Israel to end the occupation of the West Bank. In the face of student protests, as part of a series of proposed steps to foster dialogue on the Middle East conflict, Friends' Central officials later invited Atshan to speak there on his peace efforts. But the professor said he wouldn't address the school unless Eure and Helwa were reinstated. In a sign of how divisive the issue remains on the Friends' Central campus, the school's director of strategic initiatives, Lydia Martin, sent an email to stakeholders on Monday urging them to "please refrain from comment" if contacted by anyone about the lawsuit. The 58-page lawsuit lays out in extensive detail an escalating conflict over the formation of the club, the inviting and subsequent disinviting of Atshan, and the subsequent fallout including the suspension and firing of the teachers. The filing explicitly accuses the school of racism at times in its treatment of Eure, who is gay and African American, and Helwa, who is also gay and is a Muslim, stating the teachers "came to resent this racist, 'You are one of them, so you deal with it,' attitude" in pushing them to get involved with students on matters of race or sexuality. It also claims several white teachers who violated school directives were not disciplined. The suit cites the school's positive reviews for Eure and Helwa, as well as its initial approval of their actions in inviting Atshan — followed by an abrupt change in interactions between the teachers and school leaders after complaints from parents over the invitation. It also claims that school officials, led by Sellers and Scott, sought to "scapegoat" the two teachers for the controversy over the canceled speech and the bad publicity that came with it. It cites a statement that Sellers posted on the school website on Feb. 13, 2017, saying, "There are very real concerns about the conduct of Ariel Eure and Layla Helwa for their disregard of our guiding testimonies" as an example of the alleged defamation campaign. The suit also accused the unnamed board members of not properly supervising Sellers in his handling of the matter. Editor's note: A previous version of this story stated that Mark Schwartz was an alumnus of Friends' Central. He is not.